The struggle between the Kemtians and the Kmtic Canon continued against the Turkic Mongolian paganism and the remains of the Hyksos, until the Modern Kmtic Kingdom fell in 1077 BC. Thus, the Kmtic Cannon was obliterated by endless series of invaders and occupiers. Until then, there was no term for Copt, Egypt or Misr. With the invention of Jews and Judaism in Babylon in 585 BC, the terms Misr and Mizraim only appeared. And with the Ptolemaic occupation appeared the term Aegyptus and then with a close with the Romans appeared the term Coptic in 300 BC to describe the invading settler group that lagged from the Hyksos and increased by the Ptolemies and Jews and the Romans. Copt was not linked to the Canon of Yeshua, which had not yet come. 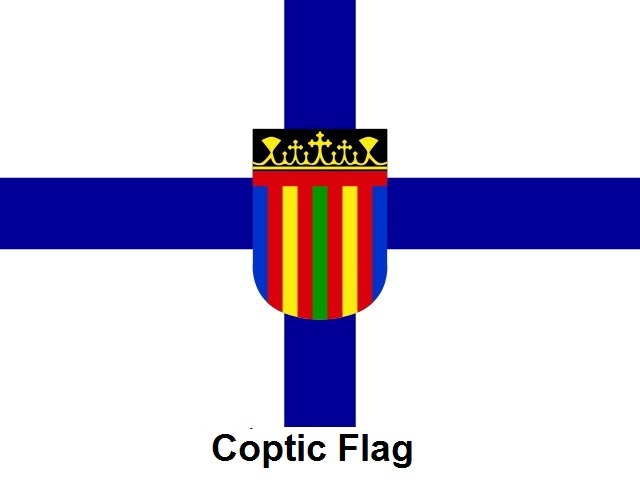 After the Jews and the Romans invented what they called the Christian religion to replace the Canon of Yeshua, the Coptic Church appeared to represent the Copts joining them and attracting the Kmtians to follow it. What are their relationships with Kmt; the Hyksos; the Jews and the Romans in particular? Are the Copts really vulnerable, innocent, oppressed and indigenous in Kmt? What are their relationships with Kmt; the Hyksos; the Jews and the Romans? The current Arabs are not Arabs at all, they are Bedouins from Turkic Mongolian origin who invaded and colonized the region at the same time of Hyksos. Original Arabs look and behave like Punt. NOT THREE WISE MEN; IT WAS 12 Ethiopian Kings Prophets & Priests Came to See Jesus In Bethlehem, by Rabbi Yahoshua Yahir. In The Hidden and Untold History of the Jewish People and Ethiopians by Dr. Fikre Tolossa we find this information on page 10-11 talks about 12 Ethiopian Kings, Prophets & Priests who came to see Jesus NOT THREE MAGI AS IS TOLD US The biblical Magi (/ˈmædʒaɪ/ or /ˈmeɪdʒaɪ/; singular: magus), also referred to as the (Three) Wise Men or (Three) Kings, were, in the Gospel of Matthew and Christian tradition, a group of distinguished foreigners who visited Jesus after his birth, bearing gifts of gold, frankincense and myrrh.. Matthew 2:1-12 TRUTH IS BEING REVEALED TO THOSE WHO ARE SEARCHING FOR THE TRUTH. How Jews, Judaism, and Hebrew were invented? My Punt Lands Hypothesis states that the Jews are not at all Israelite. Because the Jews are of Turkic Mongolian origin, just like: Hyksos, Mittani, Persians, Bedouin ʾAʿrāb, Sabaeans, Romans, Turks, Gypsies, Moors, Khazar, and others in Eastern Europe and the Eurasian Steppe. While the Israelite were exclusively Ge’ez-speaking Africans from the Lands of Punt. 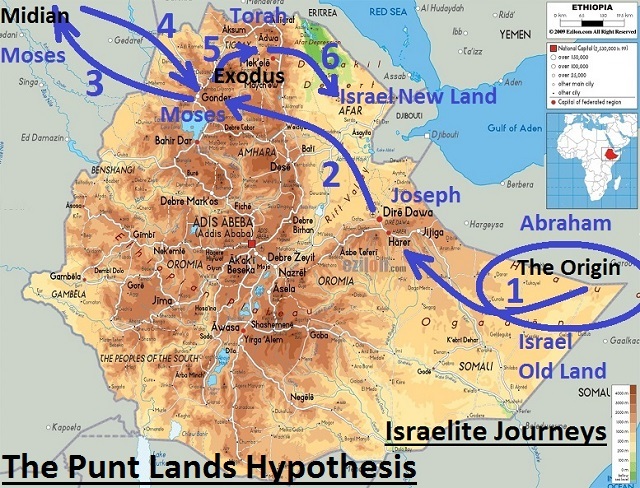 The hypothesis also emphasizes that the stories of Creation, Deluge, Joseph, Exodus, Solomon, and all other biblical characters were in the Lands of Punt; and the Creation and Deluge were of local, and not global, nature. The Exodus of 1446 BC was within Punt by crossing a river only. After receiving the Torah in Ge’ez on the Semien Mountains, Moses led the Israelite to their promised land in the Afar Triangle (the Danakil Depression) where they established Israel confederation then a united kingdom. While the original home of Abraham was near Harar city. King Solomon ruled Israel and built Beit HaMikdash (The Temple) where he kept the Arc of the Covenant. Upon his death in 926 BC, the tribe of Judah started collusion with the Sabaeans in Yemen and Turkic Mongolians roaming in the Middle Assyrian Empire (1392-934 BC). Due to Turkic Mongolian raids the whole of Eastern Mediterranean region suffered from the Late Bronze Age Collapse (roughly between the years of 1250-1000 BC). The period from 1200 BC to 900 BC was a dark age for the entire Near East, North Africa, Caucasus, Mediterranean and Balkan regions, with great upheavals and mass movements of people. The Neo-Assyrian Empire (911 BC–609 BC) brought to its collapse by Turkic Mongolians allied with Judah tribe and Sabaeans. This led to the creation of Neo-Babylonian Empire (626 BC–539 BC) which ushered the rise of Judah tribe and the collapse of other tries of the Israelite. Jews, Judaism, Hebrew language, and Rabbinic Hebrew Torah were invented during 580-530 BC by a collusion between Judah Israelite tribe and Turkic Mongolian colonizers of Neo-Babylonia and Turkic Mongolian Persians. The origin of Hebrew is Ge’ez mixed with Aramaic and Persian. The Jews (Yehudi) are not Israelite or from anywhere in the region, they were Turkic Mongolians. The Turkic Mongolians origin is in Altai Mountains and northern Tarim Basin of Western Mongolia, Eastern Kazakhstan, and Northern Uyghur. The original Israel, Israelite, and the Law of Moses were African 100% and had nothing with Arabia or Jews or Asia. The Persians and Neo-Babylonians were one branch of Turkic Mongolians who colonized Iran and Iraq. They imported the Israelite history and religion from the Land of Punt and cooked Judaism and invented the Jews and colonized Aramaic lands with their inventions. It is an ideology of political association for conquering nations and looting them with religious veils. Jesus was of African Puntite origin and he was sent by the God of the Ge’ez Israelite to bring back the lost sheep of the House of Israel from colonized Aramaic lands. He was targeted and persecuted by Turkic Mongolian Persians, Jews, and Romans. It is really amazing that scholars agree about the presence of camels, gold, frankincense, and myrrh, an eastern star and the devotion while denying that the visitors at Yeshua birth were Ethiopians. The world, and the whole Universe, need to know that the Ethiopians were the only faithfuls for message of Mosses which was for them; and they were true Christians even before the birth of Yeshua, who is Ethiopian born in foreign land. There is nothing called “Real Jews” or “Fake Jews” they are just “Jews”. But there are “Real Israelites” and “Fake Israelites”. 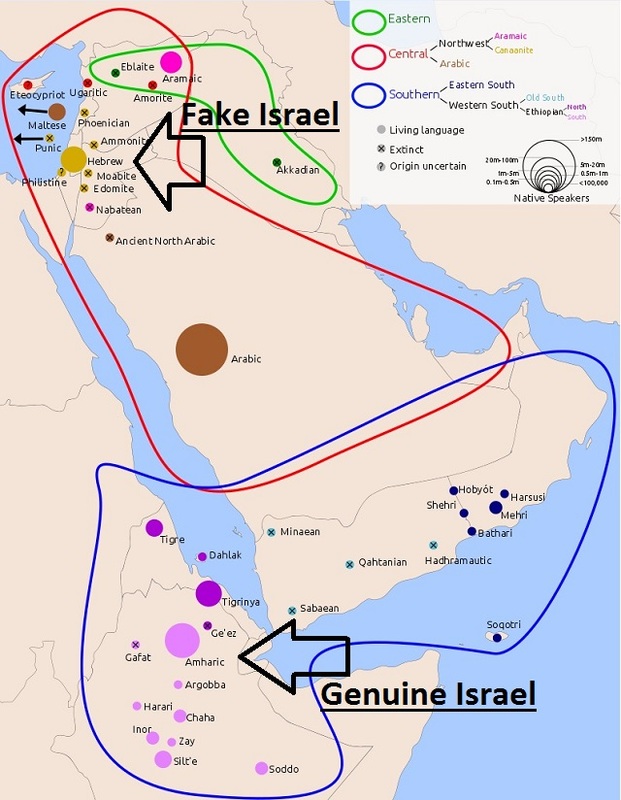 The “Fake Israeltes” are the “Jews” who are Turkic Mongolian; while the “Real Israelites” are from Punt Lands (the Horn of Africa). Colonialism, underdevelopment, misinformation and injustice began in Kemet (Egypt) since the fall of the Modern Kingdom in 1077 BC prey to various invading nomads from East Asia. The claim that Egypt was fine during Jesus’ time is untrue and unsupported by any evidence. Examining the history of the fall of the ancient Egyptian religion sheds light on the relation between the Coptic Church and the Roman rule. Claiming that the conquest of Egypt in 639 AD was a liberation led to present heretic Turkic Islam. This is all connected and essential history. It is very clear that all religious institutions and their followers are managed by a parallel similar deceptive mentality, and only tolerate reforms and the history of Holy Scriptures and nations as long as they do not touch their practices and institutions and true history. It is time to hold accountable religious, academic and media institutions, regardless of the banners they raise. Reformation, enlightenment and truth must not be biased or partial and be used for sectarian purposes by opening one eye and close the other. The works of existing religious and academic institutions propagate misguidance and misinformation systematically that lead to terrorism. History is abused. All the biblical figures from Adam to Solomon were Africans from the lands of Punt (the Horn of Africa), Moses’ Law (the original Torah) was in Ge’ez language, and Yeshua (Jesus) was an Ethiopian who was born in Assyrian Aram. His message was only for misguided Ethiopians who became Hebrews (Lost Sheep of the House of Israel) who forged the Torah and participated in the making of Jews and Judaism in Babylon in 580 BC. Jesus called the Hebrew to stop collaborating with Turkic Mongolian groups, including Persians, Bedouins, Sabaeans and Romans plus their Jewish invention. The true call of Jesus is to abide by the original Law of Moses before its falsification, and to return home, and freedom from Jewish collaboration. “Infidels” in general sense means those who refuse to believe in the existence of the Creator or reject religion or truth. In its specific indirect meaning it points, for that region and time, to the majority of Bedouins and their allies the Jews, Persians and Romans. Following the death of Muhammad, Bedouins and Jews stopped the liberation of Arabs and resumed their control. The unknown truth is that the message of Muhammad is not only piety and guidance, but it had a hidden implicit and serious liberation message that rejects the colonization of Bedouins; and ordered Arabs to resist tyranny and aggression, that is Jihad and fighting. Therefore, the Quran called on resistance and military action, not against the world but against the Turkic occupiers. It is time to hold accountable the truth of the religious, academic and media institutions, regardless of the banners they raise. Numerous evidences prove that the Jews are not the Israelites, and they are totally different group from Israelites. But the Israelites were indeed Semite, and so the Jews are not Semitic. 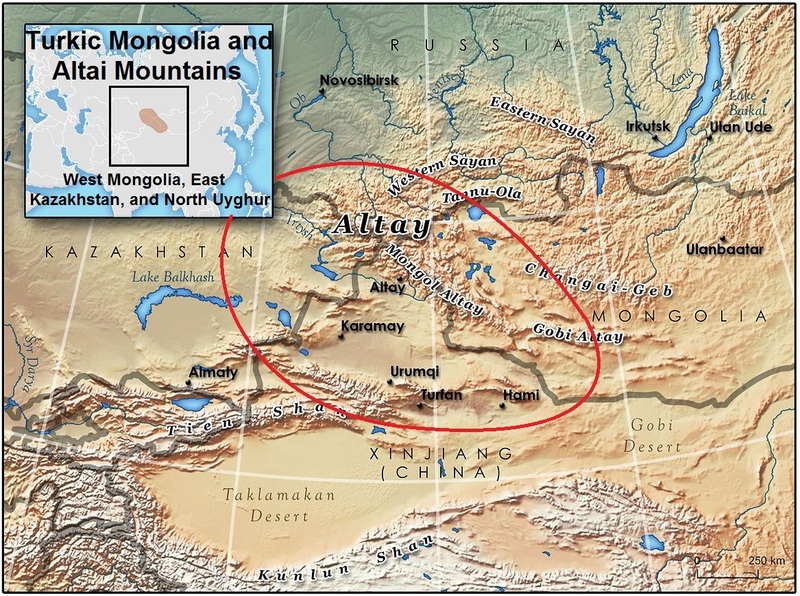 The ancestors of Jews are in fact Turkic Mongolians came from their original homeland in Altai Mountains and northern Tarim Basin of Western Mongolia, Eastern Kazakhstan, and Uyghur. The Israelites, and even Adam, Noah and Abraham and their descendants, were 100% brown Africans and their homeland was in the Lands of Punt, now called the Horn of Africa. Sam, Ham, and Japheth and all their off springs are just local tribes in Punt and they never migrated to any other part of the world; and obviously didn’t populate Earth or any planet in the universe. Proper scientific investigations could prove that Jews share the same origin with the Hyksos, Aryan Indians, Persians, Turks, Khazar, Bedouins, Romans, Huns, Roma, Sabaeans, and others. But the Israelites were obliterated by different Turkic Mongolian groups even before the Jews were invented in 580 BC. So, the Jews are the only Anti-Semitic in the world. Also, the Palestinians are two different peoples of different origins, and both of them are not Arabs. The West Bank was taken by refugees from Anatolia following the Great Late Bronze Age Collapse in 1177 BC. The Gaza region was a settlement for labor brought from Crete and other Mediterranean regions by Jews after 530 BC to replace the indigenous Assyrian Aramaic. Genetic and anthropological evidence must take into account the vast Turkic Mongolian male-bandits raids westward since 1800 BC after the use of horses for invasions from the Turkic Mongolians homeland. Amazingly, people forgot a great ancient civilizations such as Bharat and Sarasvati Civilizations. And call these by Persian name as India. No one asks how these civilizations were destroyed and who did that? It’s the Turkic Mongolians who did the same to Iran and turned it to savage Persia. Also, it is very essential to relate genetic and anthropological evidence with animal fossils, as they are much more reliable evidence. Surely, the basic assumptions in genetic researches are flawed, as they are clear in the case of Israelites and Jews and their origins and the so-called Semitic origin of Jews. A discipline that says that Semites genes populated Earth is not science. What is really unscientific and illogical is to say that all humanity and creation in the entire universe are descendants of Adam and then Noah only; and then inject this nonsense into science and call it genetics. Please give a reason and a proof for the alleged global flood and that creation legend, then we could call genetics a science. They were local events only. All sources don’t discuss the presence of camels and its relationship with Abraham and the alleged home of Israelites. Books and researches written by Jews bear conflict of interests and weaknesses. 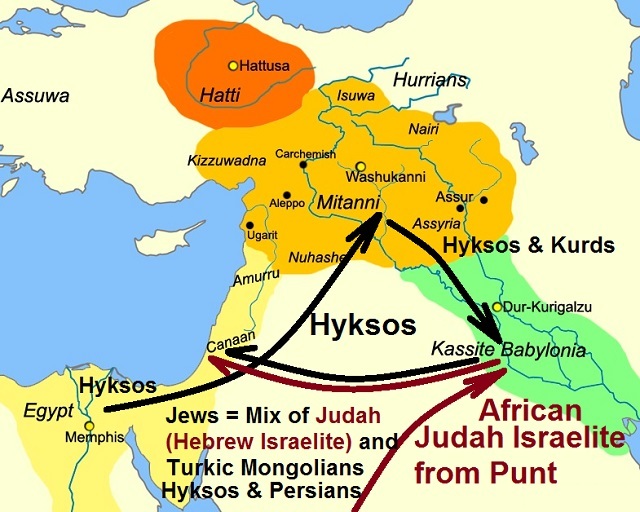 May be if researches were done on the Hyksos, the Mittani and Kurds they could relate them to Turkic Mongolians, and these could lead to discover the different origins of Jews and Israelites. We are living in colossal fallacies. Tales of mass migrations are just baseless raiders imaginations. Movements of those Biblical Shem, Ham and Japheth were certainly local and very limited. Mass migrations are complex processes which require strong reasons; robust means; endurance level and viable routes. And certainly they leave traces and effects and pick up influences. Humans don’t fly not like birds. Ge’ez is the original language of real Israelites and it is the mother of Arabic language. Therefore, Ge’ez and Arabic are Semitic; while Hebrew is a mixed invention made up of Ge’ez with Aramaic Assyrian and other languages. Therefore, Hebrew language is only partially Semitic and partially non-Semitic. The claim that DNA terms are based on linguistic relationships is ridiculous. DNA could be a science but until its premises are corrected and become scientific and logical DNA will remain just a political pseudoscience. 5- Conventional history, religion and sciences are full of fake tales and they need to be corrected. We find general and common terms such as Islamic history, Islamic culture, Muslim scholars, Islamic sciences, Islamic law, Islamic countries, Muslim peoples, Muslim rulers and many others. So what is meant by an Islamic term? What is the specific definition of Islam so as not to be confused and misunderstood? Is the meaning of Islam is related to the Muhammadian Sharia/Law/code and the Koran and the Prophet Muhammad pbuh? But the Muhammadian Sharia/Law/code, the Koran and the Prophet Muhammad all affirm that Islam is much, much older than them. So it is clear and strange that the common understanding and common sources attribute Islam to a body while the same body denies this relationship or descent. Where did this relationship or descent come from? And what is the validity of those Islamic terms? The answer is clear and logical, but it is abandoned and even rejected. 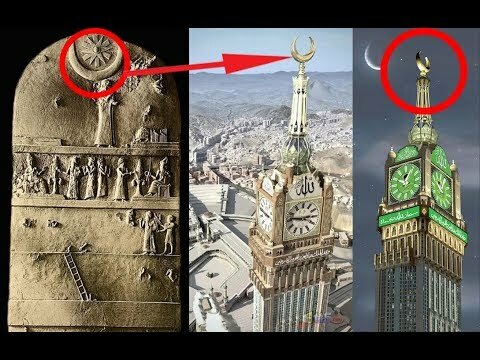 The true laws/codes are all ways leading to a single Religion, but not any law is a Religion by itself, as well as Muhammadian Sharia/Law/code and is only one of the laws lead to Religion. For example, if a house is located on the road leading to Beirut, it cannot be said that this house is located in Beirut. But the confusion and error in naming the Muhammadian Sharia as Islam or Religion is the result of the kidnapping and falsification of Muhammadian law by the Turkic-Mongolians since the Umayyad era and the following eras and even today; and their use of that Sharia after falsification as means of claiming Religion and giving them justification for invasion and expansion and occupation. Therefore, these false Islamic terms refer to false Muhammadian Law only; because the right meaning of Islamic is Religious, without any definition, and should include all true laws without discrimination in the globe and in the whole universe. The Muhammadian Sharia turned into what is now known as Islam, which deserves to be called the Turkic Islam, to distinction it from true Islam or the Religion. Turkic Islam began to form immediately after the Prophet’s migration to Yathrib (now called Medina) after the threat of Arabs, especially Quraysh. Immediately after the emigration to Yathrib, the Muhammadian Law was held hostage by the Bedouins (who are not Arabs and were called Ansar) and Jews, and both were partners of Persians and the Romans, and all of them are Turkic-Mongolians. Then immediately after the death of the Prophet and throughout the period of the Caliphate, they stepped up their campaign against the Muhammadian Law and kidnapped it, and their believers and caliphs were assassinated and poisoned and persecuted. And they ignited the great Fitnas and civil wars; and bought the Umayyad and put them for a short-term in sham power to deceive and appease Quraysh and the Arabs. Then Turkic-Mongolians killed their Umayyad allies and obliterated them and established the Abbasid state which carried out the complete forgery which continues to this day. So it is clear that the Muhammadian Sharia was killed in the cradle and its dress was stole and now pagan idolatry Turkic-Mongolians is wearing it and called itself a religion; but it is in fact an organization that should be called Turkic Islam. The real problem with both Muhammadians and non-Muhammadians is that they cannot part from the old common misconception promoted by corrupt institutions such as Al-Azhar, churches and others since the Umayyad era that Turkic Islam is the Islam and that Islam came only with the Koran and that the Religion has only one name which is Islam. Faith in every Sharia is to follow its messenger and to abide by the specific duties prescribed in its law. And faith in the Muhammadian Sharia is defined by the testimony that there is no God but Allah and Muhammad is a Messenger of Allah and to perform prayers and the provision of Zakat and pilgrimage of the Sacred House. And similarly, the belief in the Sharia of Yeshua (Jesus) is to testimony that there is no god except Elohim and Jesus is a messenger of Elohim and the performance of their worship. The same applies with other uncountable messengers. Original Mazdayasna, not the present form, for example, is one of the oldest codes and faith in it takes to the Religion, but in that nation and other nations the names of Religion are different. 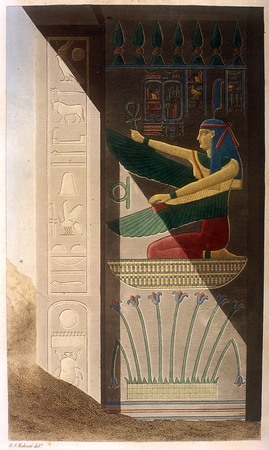 Even Kemet (the ancient Egyptians), Kerma (the ancient Nubians), the Assyrians, the Bharat (the ancient Indians), and all European and African nations had their own codes that qualified them to describe as Religious or monotheists, but in each nation the name of Religion was different but its content was the same. No any individual code could not be described rightfully as the Religion or even a religion. True Arabs are brown and very ancient nation which had many similarities and links with Abyssinians. They were part of Africa before the slow and gradual rifting that created Bab-el-Mandeb. Although Bab-el-Mandeb separate between Arabia and the Horn of Africa but it has only one name that implies that the two regions were one before they parted. But since 1700 BC, following the use of horses for invasion, a new Turkic-Mongolian group, came from Altai Mountains and northern Tarim Basin of Western Mongolia, Eastern Kazakhstan, and Northern Uyghur, of light complexion invaded, enslaved and colonized the Arabs. 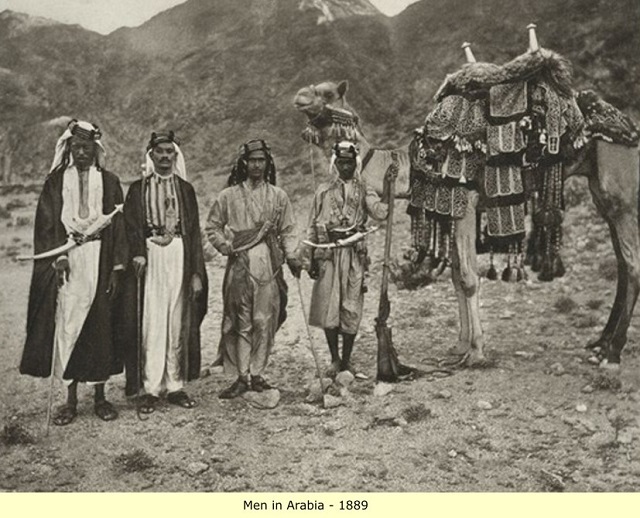 These colonizers made up the Bedouins and they claim that they are the real Arabs and Arabia is their homeland. Turkic-Mongolian groups include: yellow Indians, Persians, Hyksos, Jews, Bedouins, Sabaeans, Turks, Khazars, Romans, Romani, Huns, and controlled many enslaved groups like: Kurds, Fulani, Slavs, and Moors. Bedouins are not Arabs at all, and like Jews they stole the identity and the scriptures of Arabs and Israelites. Today’s Islam, Christianity and Judaism are forged versions of the teachings of Mohamed for the Arabs, and of the teachings of Moses and Yeshua for the Israelites. Adam, the Creation, Noah, the Flood, and the descendants of Noah are all local characters and events that belong to the Lands of Punt (the Horn of Africa) only. They are not related to any other part of Africa or the world. The Semites, Hamites, Japhetites, Canaanites, Cushites and all other mentioned in the Book of Genesis are just local tribes from Punt and certainly include the original Arabs only, but not any other group from the rest of Africa and the world. Today’s so-called Arabs (Bedouins) are closer to Jews, Turks, and Romani in many aspects, while the real Arabs were digested and absorbed into Bedouins. Arabism became a phonetic phenomenon. Real Israelites were Africans from the Punt. The Israelites were nowhere, except the Judahites who went to Babylon and Aram only. Those who reached Europe and Africa, then the Americas are Jews who are Turkic-Mongolians and NOT Israelites at all. The Israelites are brown complexion just like Ethiopians. Whites are Turkic-Mongolians pretend to be Europeans. 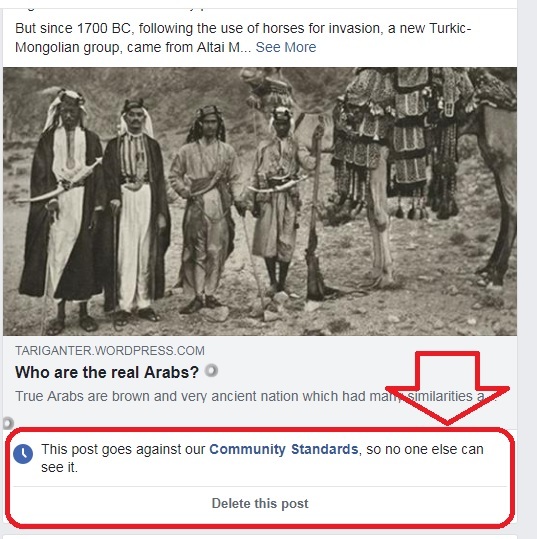 Facebook: This post goes against our Community Standards, so no one else can see it. Beware of Turkic-Mongolian groups and their fake religions.